While I wouldn’t consider myself “domesticated”, I have to admit I was super excited to make my first dinner for my boyfriend from scratch. I found the recipe on Publix Apron a month ago and saved it just for this occasion. I have previously made him blueberry muffins and brownies but they were Betty Crocker. I’m currently in North Carolina with him for 2 weeks on Easter Break. We went grocery shopping together for the first time and it was surprisingly relaxing. I thought we would’ve bucked heads because I picked up a bunch of healthy stuff. Earlier that day we went to the Durham Farmer’s Market where I picked up mint, parsley, arugula and a rosemary plant. So when we went for the rest of the groceries I picked up things like cauliflower rice, quinoa and other veggies. And there were ZERO complaints! Once I got what I needed I was super excited about making Sunday Dinner the next day. Where I’m from we’re big on “Sunday Dinner” so I thought this would be perfect for it. I was so excited when I was marinating the chicken that I mixed up the recipe. I didn’t do anything the original recipe said to do. Apparently I was supposed to shred the chicken, that didn’t happen. Secondly the marinade was for the sweet potatoes and I put it on the chicken. I was supposed to use cooked, pre-shredded chicken and I used chicken thighs. I was supposed to use tomato pesto, I bought regular pesto. And the chicken was supposed to bake at 425 F, but I’m obsessed with the tenderness I get from slow cookers. I also left out the peas and decided not to have a yoghurt sauce because the chicken was already coated. I HAVE NO REGRETS! So the recipe I’m sharing today is what I did. If you want to see the original recipe, check it out here. Chop mint. Squeeze lemon for juice (2 tablespoons). Combine pesto, 1 tablespoon lemon juice, 2 tablespoons olive oil, honey, paprika, 1 tablespoon red pepper, 1 tablespoon mint, 2 teaspoons cumin, and 1/2 teaspoon salt. Toss chicken in the mixture then cover and refrigerate overnight. The next day place the chicken in a slow cooker and cook on high for 1.5 hours. Preheat oven to 375 F. Place the sweet potato chunks in a bowl. Add the remaining 3 tablespoons olive oil, garlic powder, 1 tablespoon red pepper, and Italian seasoning. Toss until evenly coated then place in a baking sheet. Bake for 35 minutes or until tender. Remove potatoes from oven; cook riced cauliflower following package instructions. 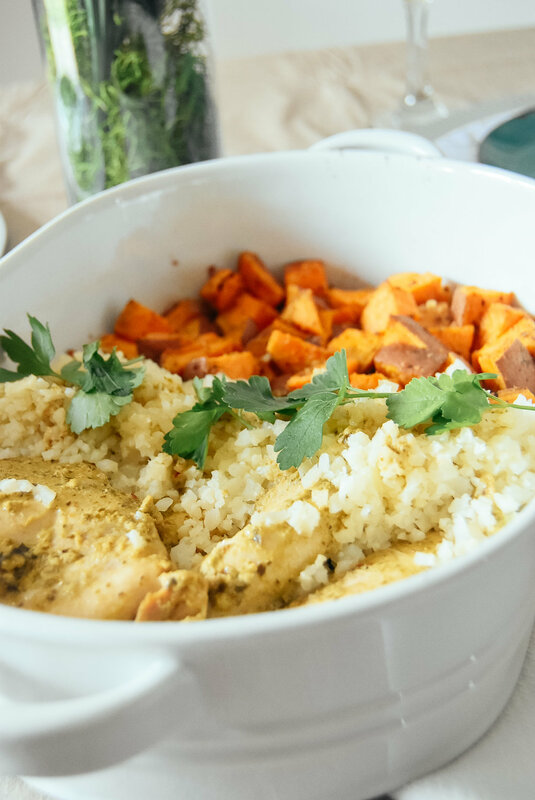 Serve chicken with roasted sweet potatoes and riced cauliflower. The verdict? My boyfriend loved it. He had never had riced cauliflower before but he enjoyed it and he had never had sweet potato in chunks the way I did it, but it blew his mind. He loved how tender the chicken was so I’m super relieved that my first dinner for him went well. Drop a comment under this post if you would try this yourself or if there’s something about it you just don’t like and don’t forget to hit the like button.